This post is a continuation of When Your Tires Kiss the Street (Part 1) which is an in-depth look at the logo designs of the track locations in R4: Ridge Racer Type 4 for the PlayStation. It is highly recommended that you read the first part of this entry before reading the remaining logo discussions. The logo for Helter Skelter somewhat of an anomaly in as compared to the other track logos in R4. Whereas the logos for Brightest Night, and Wonderhill utilize square or rectangular orientations, their corners are rounded while the Helter Skelter logo is a definite square. The outer yellow stroke further reinforces the shape and overall, this logo looks more like some kind of certification sticker or a license plate tag. 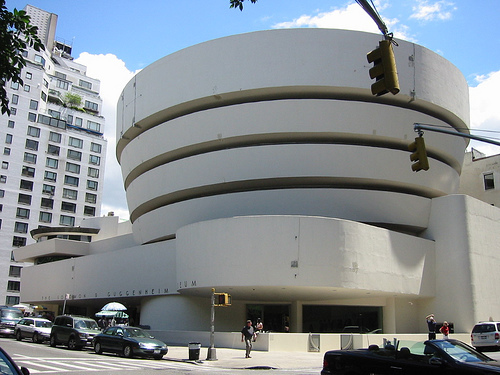 The shape in the middle seems to be a stylized depiction of some kind of structure, with the dark and light areas trading off to give the illusion of a ribbon like structure or a spiraled building; somewhat reminiscent of the Guggenheim Museum in New York. It is possible that the design is intended to be a representative of some kind of structure in-game (I have not personally identified any kind of landmark) such as particularly prolonged drift-turn in Helter Skelter; however it is more likely that it is simply supposed to be a design that connotes a sense of movement and speed synonymous with the racing genre. One of the things I do enjoy about this logo is its deceptively simple construction that results in a complex visual illusion of sorts. Essentially, the “structure” is a series of circles that reduce in size from top to bottom. The circles do not change shape in the slighest, only in scale, and by removing their intersections and filling in some minor spaces to complete the shape, is this illusion achieved. You can see this in the diagram below. The three circles overlay slightly like a Venn diagram, and the yellow area represents where I had to fill in the rest of the mark with some custom shape drawing. 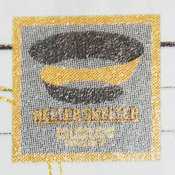 The “Helter Skelter” text is set in Helvetica Inserat, with a small treatment to the outside stroke of the “H” and descender of the “R” to connect to the underline. The text underneath is almost indecipherable from the reference photo (the logo is not printed large enough to make out what it says) but from some careful studying and inference from the Out of Blue logo, I took my best guess. The Ridge Racer series is no stranger to utilizing other Namco properties. One of the most iconic things about the music from Ridge Racer games is the inclusion of a remixed Pac-Man theme in almost every entry. Continuing this trend, the Phantomile track in Ridge Racer is a direct connection to another of Namco’s properties, the Klonoa series. 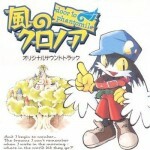 The first installment of this series, Klonoa: Door to Phantomile, was released a year prior to R4: Ridge Racer Type 4. In Klonoa, the element of wind plays a significant role in shaping the game’s universe; towns, areas, and even Klonoa’s ‘wind bullets’ revolve around the wind motif. Accordingly, the icon itself in Klonoa appears to be a stylized gust of wind. 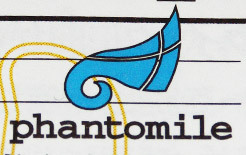 In Ridge Racer, a loose connection can be made between the spiral-like quality of the logo, and the extremely tight turns and switchbacks on the Phantomile track itself. However, this ventures into over-analyzation, and is most likely just the Ridge Racer development team lending some friendly acknowledgment to the Klonoa staff. In order to properly create this shape, it had to be entirely hand drawn. The spiral is simply too steep for standard vector drawing tools, and the sudden changes in curve and angle needed to be controlled precisely. The easiest way to go about making sure the cris-crossed lines were as accurate as possible was to actually draw out gigantic circles, and then use only the portion of the circle’s edge that intersected with the main wind icon; interesting to note (for me anyway) that the horizontal cross line actually has a very slight down curve as it nears the left edge of the icon’s shape. Brightest Night is notable for its middle section that winds through a seemingly historic shopping district in Ridge City. The shops, homes, and structures are lit in a wide array of bright colors, lending a sense that this area is the cultural center of Ridge City. Fitting then that the logo for this track is a “B” depicted as though illuminated on an animated sign common to downtown areas (or seen in the race results screen within the game itself). Consisting of an array of gradated circles, the “B” is surrounded by smaller circles that provide a small illusion of of depth and help to sell the idea of animation. The smaller circles to the left are beginning to illuminate to their full strength, whereas the small circles to the right are shrinking back down to their previous off-state. Its a strange thing to try and explain but watch an animated road sign or outdoor stock ticker and you’ll see it. To rebuild the “B”, I made a 7 x 7 grid of the gradient circles, removed the necessary shapes and scaled the smaller circles to about 60% of the larger ones. The “Brightest Night” text is set (again) in Helvetica Inserat. At first impression, Shooting Hoops conjures an obvious basketball connection. However, the track itself is a fairly circular almost NASCAR-like affair and the logo seems to depict some kind of starburst or explosion. I have wavered between the name being a more abstract concept: as though “Shooting Hoops” is meant to connote some kind of driving-fast-through-tunnels (which the track features as well as several bridges the player passes under) idea; or perhaps a translation error even though the Japanese manual utilizes the English names. Interesting however, is that Shooting Hoops being final the track in the Grand Prix mode, the player is treated to a fireworks show during the last lap of the race, simultaneously commemorating his victory and ringing in the New Year (the race time is listed as 11:59pm on December 31st). The logo design itself then is wholly appropriate as a stylized burst/explosion, accented with a gradient that like the Edge of the Earth logo is meant to express a kind of motion or ‘growth’ as in the fireworks spreading across the night sky. In recreating the mark I had trouble matching the exact skew of the circle in the original. Rather than manipulate bezier curves for an hour, I made as close an approximation as possible and hand drew the starburst shape. “Shooting Hoops” is set in a hand-italicized Helvetica Black. After Wonderhill, this track is my favorite (they are in fact, variations of one another). However, for a variety of reasons its logo is my absolute favorite of the bunch. The most obvious place to start would be the heavy black outline around the whole shape. Most of the other logos in R4 utilize no such stroke, and none quite as heavy (wide) as Heaven and Hell which helps to really define the logo against any background. It has been reported that yellow the most easily seen of all the colors, and that a combination of yellow-on-black is the most easily recognized combination of colors (which can explain for things like road signs, taxi cabs, and street lines). With this in hand, its easy to understand why this mark is so striking to look at. 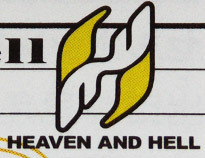 In keeping with the name, as many of the R4 logos do in a way, Heaven and Hell is a bit more literal in it’s design. Depicting two stylized angelic wings (Heaven) and two curved horn-like shapes (Hell) the design situates these elements in a mirrored orientation akin to designs like the yin-yang or a recycling icon. The way in how the horns curve and the orientation of the wings around a central point look like the logo has just stopped spinning wildly through the air like some kind of bladed projectile. It really conveys a strong sense of speed and power. Recreating the mark was a fairly simple trace job that involved creating one side and then rotating it 180 degrees to its reverse. The biggest challenge was getting the outside “point” of the wings to look correct, the angle required for the change in direction is a bit awkward. The text is Helvetica Black. As stated, usage of logos in this manner is not a new concept, nor was it even during the late 90s when R4: Ridge Racer Type 4 was in development. These logos have however stuck with me through all the years, as a kind of oddity in the game world. The amount of time and energy put into such a small feature is so easily overlooked when the main concerns of engine optimization, game mechanics tuning, and musical composition are the big factors in how a game is received. Beyond that, these logos are great (or at least interesting) works of design that I feel do their very best to flesh out the world of Ridge Racer, and inform the player about the game in however small way; which is something all designs should aspire to do. R4: Ridge Racer Type 4 is a copywritten work published by Namco Ltd. a subsidiary of Namco Bandai Holdings on the Sony PlayStation and developed by Namco Ltd. All works of art depicted and recreated have been done so in an academic pursuit to foster discussion and better understand the process of their creation. Any and all rights are held by their original creators. Visual Attack Formation does not utilize these works for commercial or financial gain. Please contact Visual Attack Formation if you are a representative of a publisher or developer and feel that your work has been infringed upon. I stumbled upon this site when I was looking around for the Phantomile track logo. R4 is my favorite game for many different reasons, one of them being the overall design and presentation of the game. From the track logos to the menu interface, car design and music it was clear Namco was going for a very specific feel. Most developers wouldn’t bother to invest so much time and effort into things like that for a racing game, which is why R4 is still a one-of-a-kind experience, even today. As someone with an interest in graphic design, the game really struck a chord with me (even when I first played it at the age of six). Your analysis was interesting and informative (often times in the game the logos are too small to observe fully), and you did a great job with the recreations. If you are still interested, I’d love to see a follow up article on the manufacturer logos or – although this is out of the realm of graphic design – car models. The Assoluto Bisonte on the cover of R4 still stands as one of my favorite car designs ever, real or fantasy. I’ve not played R4, but I think the logo designs are pretty spiffy, myself. Anyway, awesome (and pretty interesting) blogging thus far, keep it up! You’re definitely right about the missing support on the G character, great eye! I’ll check it out (its likely Arial since what else would a font that looks so close to Helvetica be?) and update the original post. Thanks for reading! 1 Pings/Trackbacks for "When Your Tires Kiss the Street (Part 2)"